Can you use audio recordings to entrain your brainwaves, alter your consciousness, and “meditate deeper than a zen monk”? In this post we set out to shed light on that question with a fairly simple open-source EEG experiment. Binaural beats consist of two audio tones of slightly different frequencies, one played into each ear. If the frequency difference is right, this beat frequency can be heard as a strange pulsing sound inside your head. Products from The Munroe Institute, the Centrepointe Institute, and other companies purportedly use binaural beats to entrain brain waves and alter consciousness. 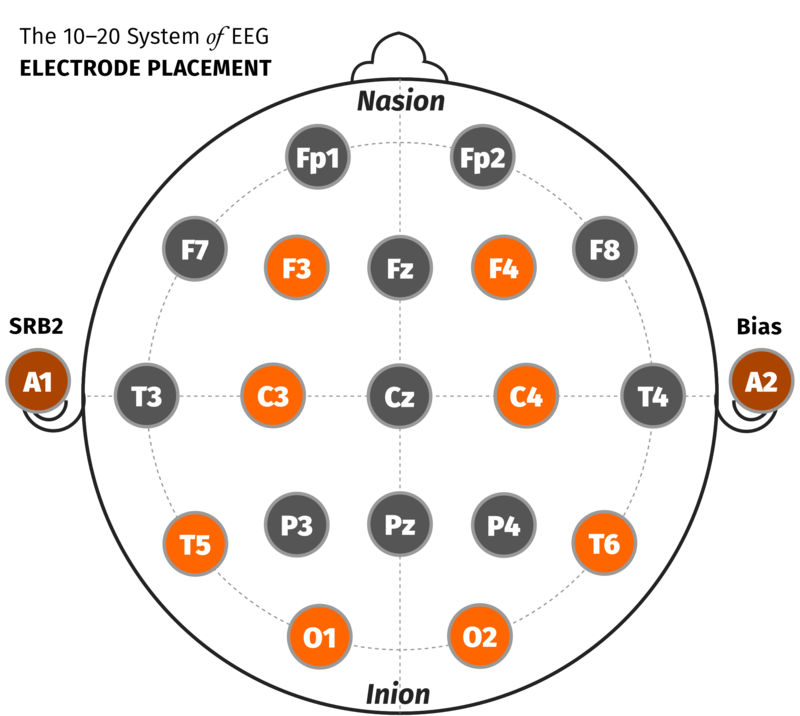 Ever since we first got the Emotiv EPOC consumer EEG headset a few years ago, we’ve wanted to test this claim and measure what effect binaural beats actually have on brainwaves. Unfortunately, without proper recording or analysis capacity, our tests with the EPOC were inconclusive. Now that we have an OpenBCI system we decided to do a more careful experiment. This short post summarizes the experiment and the results. We’ll go into more detail about the experiment setup and analysis in future posts. We aim for high-quality science, but we’re not EEG experts or professional researchers. There may be bugs in our code, glitches in our mathematics, shorts in our circuits, or flies in our ointments. Results are not guaranteed, but our EEG data and analysis files are available for independent experimentation, replication, and interrogation. Please let us know what you find! Our EEG acquisition hardware consisted of an OpenBCI board (32bit model), used with passive gold-cup electrodes and Ten20 brand conductive paste. We used electrode positions F3, F4, C3, C4, T5, T6, O1, and O2, highlighted in the diagram at right. We used the OpenBCI’s reference electrode SRB2 on the left mastoid (earlobe), and Bias on the right. The experiment data was recorded in OpenViBE, using a Python script in OpenViBE to control the SBaGen binaural beat audio generating program. Audio was played to the subject on Sony MDR-7506 headphones. We used pink noise for the control segments, and pink noise with 17 Hz binaural beats for the trial segments. We picked 17 Hz because it is an area of the spectrum that doesn’t usually have any prominent activity going on, making it easier to spot any effects caused by the binaural beats. EEG data was recorded into a CSV file, and then analyzed in python using the Numpy and Matplotlib scientific computing libraries. We started from William Audette’s very helpful MIT-licensed ASSR analysis IPython notebook. Once we had some of the bugs worked out of our code, we moved most of the code out of IPython and into a normal Python file, which now lives on GitHub under the title EEGrunt. Spectrogram of all control and trial segments, from channel 8. 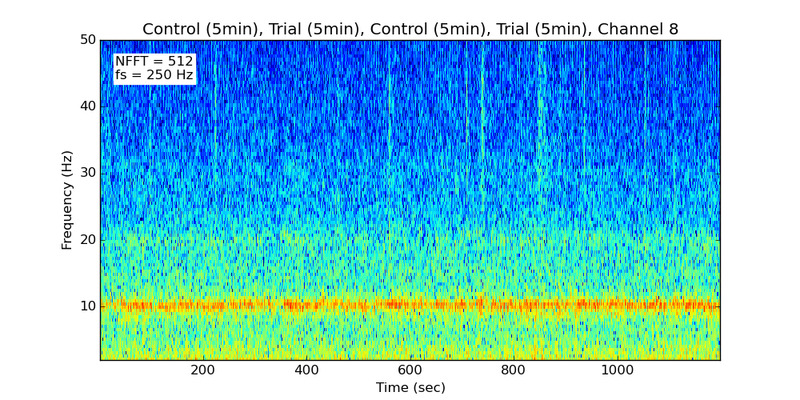 In the spectrogram, there is no visible change between trial and control segments at the 17 Hz target frequency. We generated similar plots for the other channels, with similar results. In our experiment, the binaural beats did not produce any significant entrainment of the subject’s brainwaves. Although somewhat of an anticlimax, this is an interesting result. In addition to 17 Hz, we tried a similar trial on a different subject at a target frequency of 8 Hz, also without a noticeable result. Does this mean that binaural beats really have no effect on brain waves, and the folks promoting them are peddling pseudo science? Maybe, but not necessarily. Trial length — we used five minute trial and control segments. This seemed like a reasonable time for an effect to become visible but it’s possible that, for some reason, more time is required. Frequency — we tried trials at 8 Hz and 17 Hz. Again, it seems likely an effect would be visible at these frequencies, but we can’t rule out the possibility that binaural beats could be somehow frequency-specific. Subject selection — we’ve done this experiment on two subjects, but perhaps the effect of binaural beats is strongly dependent on the individual. In this case, tests with more subjects would be needed to determine if there was an effect or not. We plan to contact some of the many commercial binaural beats vendors for comment. Do you know of similar experiments, possible bugs, or improvements that we should make to the experiment design? Please let us know in the comments! 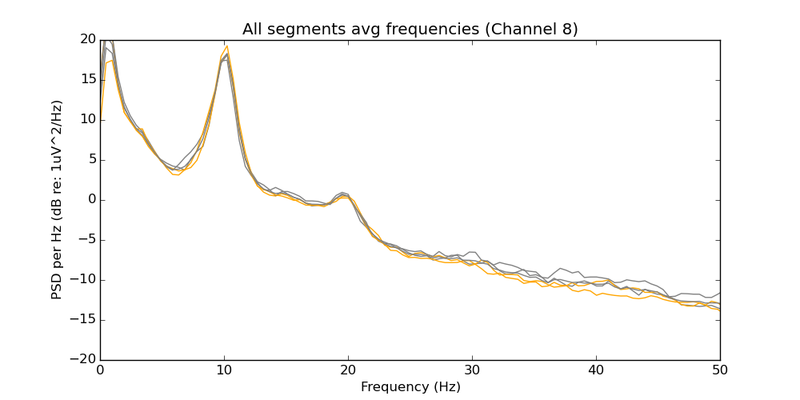 If you are an EEG researcher, you could also download our data and Python scripts, or try replicating this experiment with your own setup and let us know what you find.